The new "Giro" prepaid card replaces the existing blue prepaid cards and allows riders to reload the card's value online. RIO DE JANEIRO, BRAZIL – This coming Saturday, November 24th, MetrôRio, the company running Rio’s mass-transit subway system (metro), will introduce a brand new fare card to riders called the “Giro,” a prepaid card that will replace the traditional blue prepaid card (cartão pré-pago). The “Giro” prepaid card replaces the blue prepaid card, which will still be accepted throughout the system, photo internet recreation. “The Giro card will make Rio’s life easier, with more safety and conveniences in mobility, culture, and leisure,” exclaimed MetrôRio’s communication manager Simone Pfeil. The “Giro” prepaid card will cost R$3 and can be purchased at the ticket windows and self-service machines in 41 metro stations. The card must be purchased with a minimum initial value of R$5 loaded, but after its first use, there is no minimum value for reloads. Once the card is purchased, customers can log onto MetrôRio’s website and register the “Giro” card number along with the customer’s CPF. According to MetrôRio officials, registering the card online will open a host of new features to card holders. 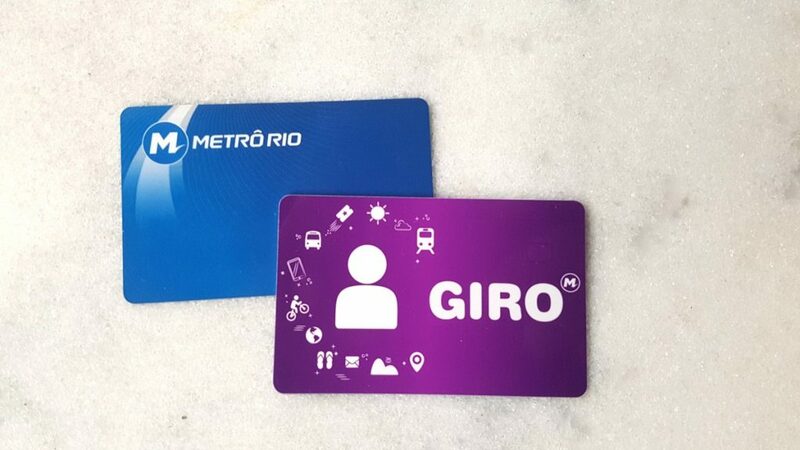 First, unlike the existing blue prepaid cards, once the “Giro” card is registered with MetrôRio, customers will be able to constantly reload the card’s balance through the website without ever having to go to the station. Second, if the card is ever lost or stolen, users will have the ability to block the missing card rendering it unusable, freeze its balance, and transfer that balance to a new card. Finally, the “Giro” card will offer a variety of discounts and conveniences for users. When a rider reloads R$25 or more to the card, they will receive a thirty percent discount code off one Uber ride that will be good for one week. The “Giro” card can also be used at BikeRio stations to rent a BikeRio bike rather than a cell phone or credit card. During December 2018 and January 2019, “Giro” card holders who signup for BikeRio’s monthly plan will receive the first month free (normally R$10). In addition, the “Giro” card will provide various discounts at the SmartFit gym, GOL airlines, the next Rock in Rio, and other vendors soon-to-be-announced. Though the “Giro” replaces the existing blue prepaid cards, which will no longer be sold, the blue cards will still be accepted throughout the metro system. Rio’s metro runs Monday to Saturday, 5AM to 12AM, and on Sundays and holidays from 7AM to 11PM. A one-way ticket on the metro costs R$4.30.